Meet the GAFFER... Grymn Pilot of the VTOL craft parked in front of Bob and Dave in my Diorama of Doom entry. 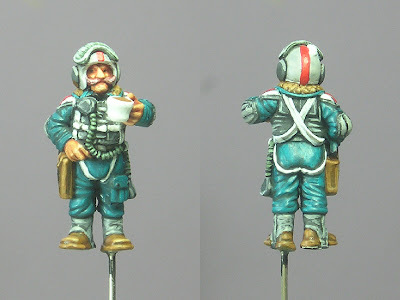 As can be seen from his helmet and shoulder stripes The GAFFER (Grymn Air Force FlyER) is a member of Red Squadron - and that colouring will be evident on the flyer itself. The flight suit webbing and life-vest are painted to match my other painted Grymn. I'd drooled over this figure ever since Kev White of Hasslefree Miniatures had show it on his WIP web site over 6 months ago. He was kind enough to send me a master copy of the figure, and the detail on it is incredible. The front of the life vest (i assume thats what it is?) is amazingly detailed and a real challenge to paint accurately. The figure is just 23.5mm to the top of his helmet. I hope Kev thinks I have done this justice! There are 12 separate colours used on this base, not including any i mixed myself. 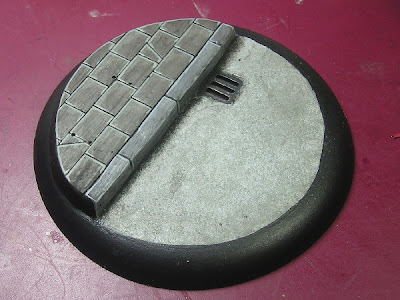 Trying to get the stippled grey of the tarmac surface was a bit of trial and error, hope it works. Tarmac is not black! Looking awesome. Love the pilot, really want one myself, but lack of cash and no real use for it is a problem. I thought about joining in with the DOD this year but then I whimped out. Glad to see that you stuck with it, the base is looking really nice and the tarmac is excellent. Keep up the good work!